Home > culture, dating, fun, health, humor, Life, love, Man Law, music, musings, Relationships, text	> All Glory is Fleeting: An Exclusive Interview with Robert Greene, Part II. 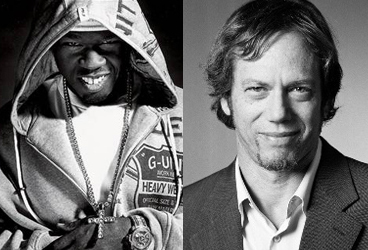 All Glory is Fleeting: An Exclusive Interview with Robert Greene, Part II. Ethan Bishop: In Lesson 7 – Know Your Environment from the Inside – Out; Connection; you state that to succeed in life and business, you must first connect with your audience and build outwards instead of starting with your idea and finding your audience. That seems like obvious advice yet so many organizations fail at this simple concept. What are some ways that leaders can keep themselves “connected” with the audience? As we continue to rise within our respective social groups and organizations, how can we retain the ability to make confident decisions whilst still keeping our “audience” in mind? What you can't see in the picture is Robert lays his gun on the table before the Arm Wrestling match begins. Robert Greene: It’s really a function of one’s particular mindset. Are you someone who is inner-oriented or outer? The inner types, most people, spend a great part of time in their heads. They are constantly listening to a voice inside themselves. They are not observant. In a conversation with another, they are half–listening and half imagining what they would like to say about themselves. On a walk in the woods, they are playing over in their minds endless internal monologues and conversations. The outer–directed type listens to people with intense absorption and is a great observer of the world. The inner types begin with a lot of great ideas in their head and then look for an audience and the facts that will fit their conception. The outer types start with the facts, the things they observe in the environment, the trends in society, and from there construct their larger plans. In this world, with our heads crammed with so much information from so many sources, the tendency is for us to become increasingly inner–oriented. It is a kind of gravity we find hard to resist. To have power in this world you must force yourself in the opposite direction. I am a great believer in the inductive method of reasoning. This means, you always start with the facts. You look at the world or the audience you are studying. You let go of as many preconceptions as possible. You enter their spirit and their mind. From within them or this environment, you gather so much information that you start to see connections and out of this process certain ideas start to crystallize. What you then create is a synthesis of your own impulses and some deep feedback from the outside world. It is the perfect balance. If you move in this direction you will not fail to connect and to create something powerful. You will naturally find an audience because you have interacted with something real and it will resonate with the public. As you point out, the tendency is that as you have success in this world or rise up within an organization you lose contact with that audience and with the outside world. You surround yourself with people who share your opinions; you rely on past strategies. So, with success you must be extra vigilant. This means opening more channels to your audience and to the outside world, finding new ways to connect with your audience or base of power; getting out of the office and seeing the world on the street level; remaining open to criticism and changing your old ways of doing things; keeping up on all of the latest trends washing through the world. It is not that you must slavishly follow the public’s tastes, but rather that you maintain this constant balance of ideas and contact with the world, inner and outer. You need to always be testing your ideas in the real world, in real time. *Attune Yourself to the Details. In our results driven, bottom-line society, how can one be sure that they are not short-stepping the process? Do you feel that society encourages people to take shortcuts in order to get ahead? Robert Greene: We all have a feel for what process means. When we learn a language, or a game, or a musical instrument we understand that it will take time and much practice, some of which involves drudgery. We have to be patient. After a year or two, the game or the instrument suddenly becomes easier and we move on to the next set of challenges. In such processes there are no possible shortcuts. No teacher, drug or book in the world can allow us to skip steps or decrease the time we need to practice to master the craft. We know this, but somehow when it comes to other endeavors (such as making money or creating our own enterprise) we imagine it is different. We live in a society of speed and shortcuts. Technology makes everything so easy, giving us this instant power, so why shouldn’t this be the case with everything in life? Such belief can be dangerous and it grows within us unconsciously. We develop the feeling that hard work and practice are dull and unnecessary. We lose touch with the process. On the larger scale, you build your business slowly. It is like a house with a solid foundation. You have made the proper connections and alliances. You spread out organically. You create a scale to your business that matches your skills and level of proficiency. When you start to expand it is with a definite purpose and larger plan in mind, not just for expansion’s sake. It is not easy to follow such a path nowadays, but to the degree you manage to slow yourself down you will leap above all of the other impatient suckers in this world. Ethan Bishop: How do you feel that The 50th Law builds off and differs from the 48 Laws of Power? For someone who is not a “fan” of Curtis Jackson’s (50 Cent) music, what might they find interesting and learn from the book? Robert Greene: I consider this in many ways the ultimate law of power. I often think of the following metaphor—we are all like samurai warriors having to do battle in life, with others and with ourselves. The fearlessness that we talk about in here is like the primary position, the primary stance you must have in life. If you are secretly infected with fears, then you have no balance. Good and bad things affect you too much. You might have great knowledge about the world, know the 48 Laws and be a good student of strategy, but none of it will matter because when events intersect your ideas and actions, you tend to overreact. You have not mastered your fears and you have not mastered yourself. You can be pushed easily to one side or the other. From a state of inner balance, you are not afraid to take action on your own, or to go against conventional wisdom; in the middle of adversity, you are able to keep your head together and see the secret opportunities from within any crisis; you know how to perfectly upend and defeat your opponents, unconcerned what people might think of you in the short–term; you know how to lead and not be lead by events or people. When it is necessary, you can take bold and even risky action, because you know that boldness creates its own circumstances. In looking back at all of the great figures that I wrote about, it seems to me that they all shared this quality—from Napoleon Bonaparte to FDR. In this sense, The 50th Law is more about a general mindset you must develop than specific fighting strategies in life. You don’t have to be a fan of 50’s music to appreciate the book. But you should find the story of his life inspiring and enlightening. My books are often centered around characters who rise from the bottom to the top on their own, through their “own arms,” as Machiavelli would say. They show us how it can be done, without money or connections or privilege. We are entering a kind of new weird order in this world in which the old styles, the old ways of doing things, the old icons of power are no longer relevant. They are dinosaurs. The old mainstream media is about to die off, and thank god. From within this dying order new figures of power are emerging. They are younger, think differently and are not burdened with the past and old ways of doing things. They approach business or politics from a fresh angle. They can handle the chaos that comes from decentralized sources of power. Fifty exemplifies this new type. He came from the bottom of America with skills learned on the streets and he is able to navigate the treacherous waters of the 21st century much better than the lumbering dinosaurs. We have much to learn from these new types and that is what you will gain from the book. Robert Greene currently resides in Los Angeles, California. He maintains a blog called Power,Seduction and War. 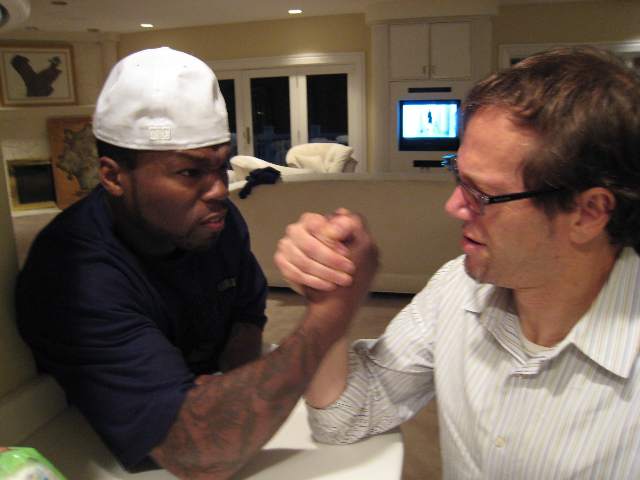 Be sure to follow him on Twitter@RobertGreene48 and check out his latest book The 50th Law. Man Law #66 – Build Social Insurance! All Glory Is Fleeting: An Exclusive Interview with 48 Laws of Power and The 50th Law Author, Robert Greene, Part I.